One of the biggest benefits of doing system reviews from boutiques like DigitalStorm is the chance to see what talented builders do with brand new hardware once it's released into the wild. Single consumers/enthusiasts get used to and understand the range of performance typically available in overclocking retail kit, but boutiques have to contend with overall performance potential of a range of products on a larger scale. Whether or not you get a decent overclock on your i7-4770K isn't a huge deal; you bought the chip, you're good to go. But for a boutique it becomes a more serious issue, defining their advertising and ultimately helping us all paint a fairly broad picture of what we can expect or at least hope for from new kit. If you're like me, you were probably incredibly underwhelmed by initial reviews of Haswell. Ivy Bridge proved to be a decent overclocker, but Intel's miserly switch from fluxless solder to thermal paste as a thermal interface material in their chip packaging put a hard limit on what we could really do with it, and they're continuing that aggavating trend with Haswell. One of the most frustrating results is a flattening of the overclocked performance curve from Sandy Bridge to Ivy Bridge, and thankfully we can at least test and see today if Haswell does anything to change things. With the recent refresh of our benchmarking suite (I carry over notebook benchmarking to the desktop and then add a surround test), I realized we had a perfect opportunity to test just how much progress we've made from one generation to the next. One of the perks of working in the industry is access to high end kit; my personal desktop workstation isn't just fun to have, it also serves as an extremely useful reference platform that I can now pit DigitalStorm's attractive new micro-ATX mid-tower, the Virtue, against. DigitalStorm has four configurations for the Virtue, starting at $1,403. 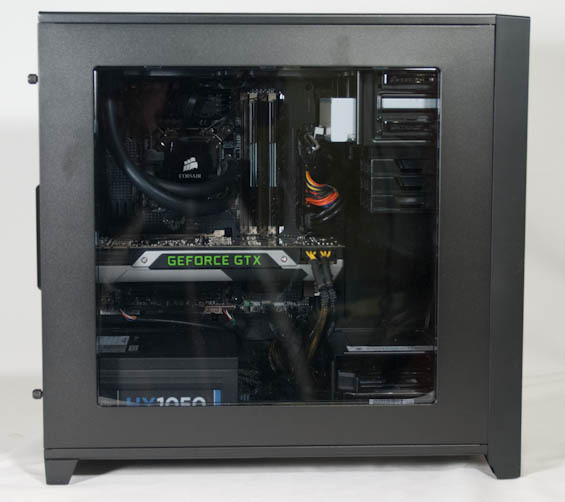 The entry level offers a basic quad core Haswell with no overclocking and a GeForce GTX 650 Ti Boost; it's adequate for gaming, but informed consumers will want the second level model featuring an i5-4670K and GeForce GTX 770 for $1,735. Worth mentioning, though, is that DigitalStorm offers a 120GB Corsair Neutron GTX SSD and 1TB HDD minimum, across the board, in all configurations of the Virtue. 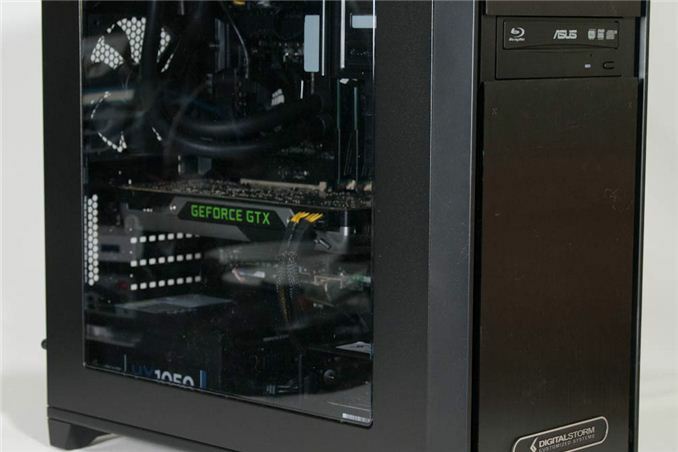 The highest end model bumps the SSD capacity up to 240GB and the GPU to a GeForce GTX Titan. There isn't too much to say about the Virtue as we have it, though. DigitalStorm was able to eke out a healthy 4.4GHz overclock on the i7-4770K, but the overclock range they offer is just 4GHz to 4.4GHz, which is underwhelming to say the least. That's not their fault, though; iBuyPower only goes up to about 4.2GHz, ~4.5GHz if you're using one of their signature custom liquid cooling systems. CyberPowerPC offers roughly the same "20% overclock" which works out, again, to about 4.2GHz. DigitalStorm's overclocking options are also essentially in line with AVADirect and other boutiques; Haswell just doesn't have a whole lot of headroom. Meanwhile, DigitalStorm does offer performance tuning on their graphics cards, but the GTX 780 in our review unit is left at stock. Representing the best and brightest of the last generation is my own custom workstation which will be referred to in charts as the "Reference PC." This is, in my humble opinion, about as good as it can get before you switch over to a custom cooling loop. Nice review. I too am unimpressed by Haswell, but even more unimpressed by the GTX 770. Basically an overclocked 680. Only the 780 is even worth mentioning IMO. That's just my opinion and since I am on SLI 670s I suppose my view is a little unfair. The GTX770 is worth mentioning for the blower- it uses the Titan/GTX780 blower instead of the GTX680 blower. Lower temps, less noise, especially when pushed. Really ?? The only GTX770 with blower-style coolers listed on the US eVGA website as of 06/26 all have GTX680-type coolers, no Titan cooler. Hm. You're forgetting the price argument about the 770. The 770 isn't just an overclocked 680. It's an overclocked 680 at former 670 pricing. So not only are they giving you more than top end performance from the last card line, but they're selling it to you for $100 less. Wow, I didn't realise the Gryphon came with the ALC892. Would have assumed an ALC898 minimum. I would guess the money on that motherboard was spent on the TUF features first before the audio.